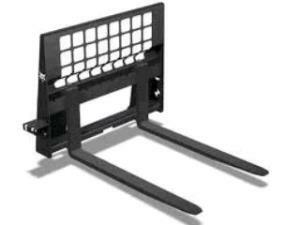 This fork attachment attaches to our skid steers giving them the ability to pickup and move items such as pallets . Add it on to your next skid steer rental, or rent it to attach to your own. Machine must be brought in to ensure proper fit. * Please call us for any questions on our forks bobcat skid steer rentals in Hillsdale and Ridgewood NJ.